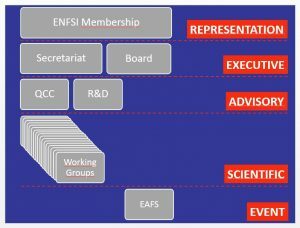 ENFSI is governed by a five-member Board. The Board is accountable to the Membership. The ENFSI Secretariat supports the ENFSI community and the Board in particular in their duties. The Working Groups, the Standing Committees and the Board are running projects on a regular basis to establish ENFSI’s aims and objectives.